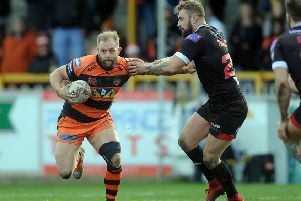 Castleford Tigers have confirmed that winger James Clare has joined promotion-chasing Bradford Bulls and has left the club with immediate effect. Hometown player Clare will join up with the Bulls on a deal until the end of 2016 as they look to bolster their squad and push for promotion back into the Super League when the Middle Eights start. Clare made his Tigers debut against Huddersfield Giants in 2012. He has made 32 Super League appearances with the Tigers, scoring 21 tries. A great 2014 season saw him grab nine tries in 13 games and earn himself a one year extension that would have seen his deal run until the end of 2016. The biggest highlight of Clare’s time in a Tigers shirt came away at Wakefield in 2013 when he grabbed four tries. He has been on a dual contract with York City Knights and has been playing in Championship One in recent weeks, but is now looking forward to taking on Wakefield again with a Bradford side in the middle Eights. “It’s been incredibly difficult to have to leave my hometown club, but with limited chances at Cas, due to them having arguably the two best wingers in Super League in Denny and Justin, it made this a tough year for me,” said Clare. “Bradford offered me an opportunity to really challenge myself personally as a player and I’m really excited to take on that challenge. “I’m incredibly thankful to the York City Knights and James Ford for the time I spent there on dual reg. They are an unbelievably close group and I wish them all the best for the rest of the year and hopefully a spot in the championship next year. “I also wish Castleford all the luck in the world for the future. The players and coaching staff have been brilliant with me over the last few years and I feel that they really deserve something special to remember. Tigers head coach Daryl Powell said: “I would like to wish James all the best on his move to Bradford, which will take place with immediate effect. “James has worked hard during his time at Castleford and has been a pleasure to deal with. Tigers chief executive Steve Gill said: “James has been an excellent servant to the club. “There were some heartfelt discussions had before both parties decided the best way forward to further James’ playing career.